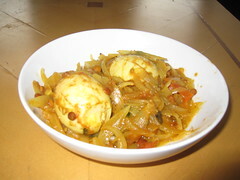 Cook the eggs in boiling water only for ten minutes. Remove the shell and make slender slashes on the eggs vertically using a knife. Heat oil in a pan and add mustard seeds when it is hot. When mustard splutters add channa dal and curry leaves. Then add onions and fry well till it become transulent. Add little salt so that onion cooks fast. Add chopped tomatoes and cook till it become soft. Now add turmeric,chilli,cumin and coriander powder.Mix it well. Spray little water to avoid sticking in pan. Cover the pan and cook it well for about 5 minutes or till masala is cooked well. Add water as per your desired consistency and cook it. Now add boiled eggs and mix well with masala . Cover the pan and keep it in sim(low flame) for about 5 minutes. 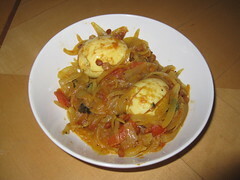 Egg Masala is now ready to serve. 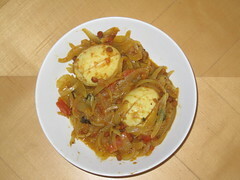 Egg masala can be served with rotis, dosa, and with any kind of bread. 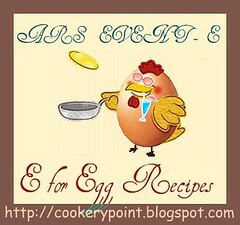 I am sending this recipe to ARS Event E for Egg recipes originated by Charitha. Hope all would like it and try this recipe.